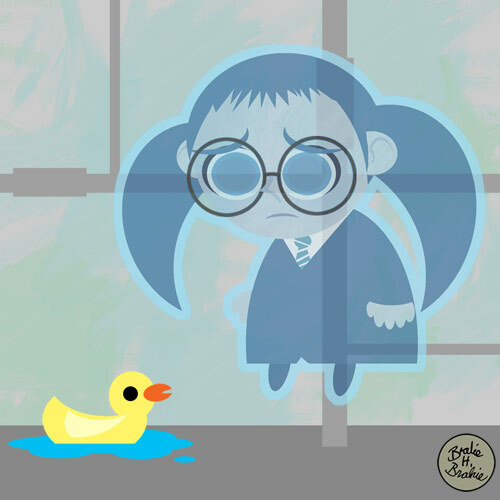 Moaning Myrtle is also the first character I'm featuring who doesn't have a pet, so I decided to give her a little rubber ducky. Maybe it will help cheer her up (I doubt it). Like Elvis, Moaning Myrtle died in a bathroom. Also, like Elvis, she continues to haunt that bathroom to this day. Wait... the Brits don't say "bathroom." They call them "poo-poo closets", I think. Anyway, it's a pretty lousy gig for a ghost, especially one who lives in a massive, gothic, enchanted castle full of nervous children. Overall, Hogwarts is an ideal place for a ghost. Don't limit yourself to the potty, MM! Myrtle died in the bathroom because it was also the location Salazar Slytherin used to build the entrance to the Chamber of Secrets, and Myrtle had the misfortune of catching Tom "I Love Anagrams" Riddle sneaking into the chamber. The question here is, why did Mr. Slytherin use the girls' restroom as the place where he hid the entrance to the hiding place of his giant snake? That... that does not seem appropriate. 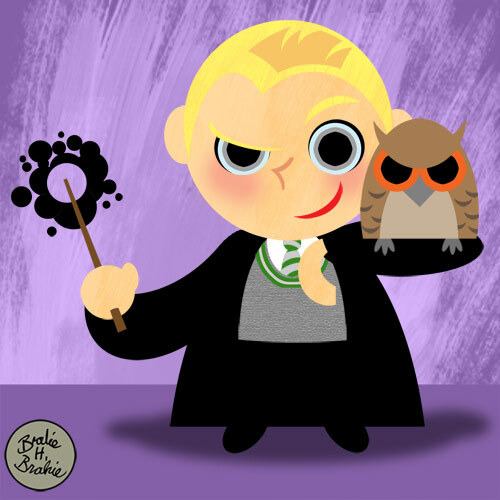 Our second vectory Potter character is Hogwarts Headmaster Albus Percival Wulfric Brian Dumbledore and his pet phoenix, Fawkes. 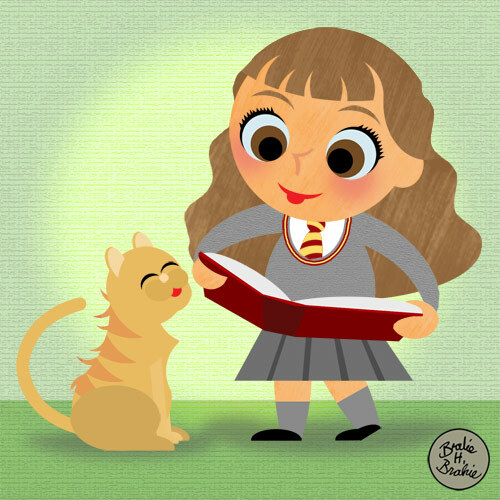 I wish every Harry Potter character had a pet instead of just most of them. I enjoy having their pets in there. I wonder if anyone else didn't read the Harry Potter novels for a while because they picked up a copy, saw the name "Professor Dumbledore" in the synopsis and thought, "Nope. Too stupid." I had to hear how good the series was several more times after that before giving them a chance. Dumbledore is a great example of a delightful literary type: the gentile wise old man who is also secretly a complete badass. One of my favorite moments of the entire series belongs to old Albus. It's when the ministry of magic comes to arrest him, and he responds: "Well, it's just that you seem to be labouring under the delusion that I am going to - what is the phrase? - come quietly. I am afraid I am not going to come quitely at all, Cornelius." And then BOOM. Complete badass. Dumbledore loves candy, which is why he's depicted here enjoying one of his favorites: lemon drops. Loving candy is kind of a dangerous thing to do in the wizarding world since there are chocolate frogs that will jump away from you, exploding candy's that might actually kill you (unlike that urban legend about Jerry "Leave it To Beaver" Mathers), and of course those Every Flavor Beans might be delicious or might be Shaq's armpit flavored. 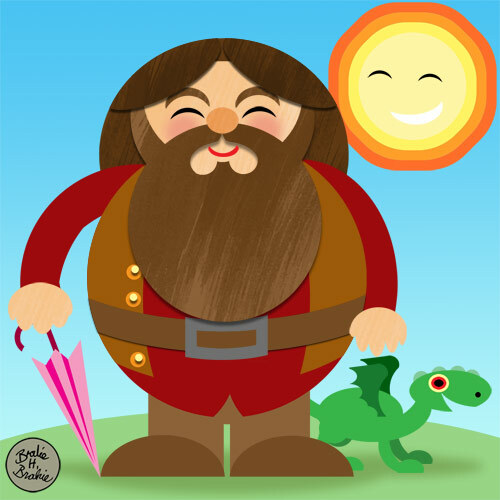 Another favorite A. P. W. B. Dumbledore quote: "Youth cannot know how age thinks and feels. But old men are guilty if they forget what it was to be young." True dat, Wulfric. Pass the candy. 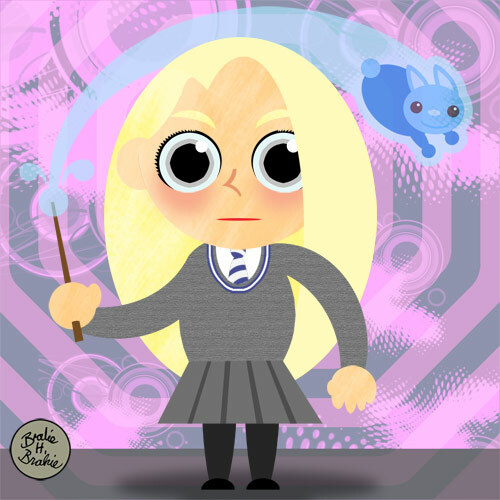 I tried to make Hedwig as much as close to my memories of the owls on the Memory game tiles my family had in the 70s. I kind of love him. There's a little Mary Blair influence in there too. Harry Potter is "The Boy Who Lived!" Kind of a weird nickname to walk around with all the time. 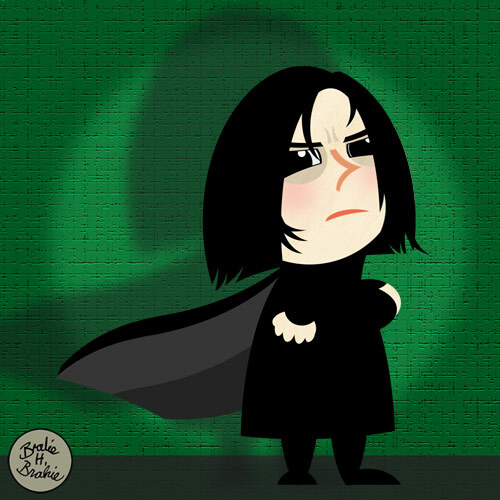 What if someone came up to you and said, "hey, you're the boy who lived!" I'd be like, "hey, you're alive too, dumbass!" Of course, I know they mean that he survived an attack from the evil Lord Voldemort (which, translated from the Latin means "Volvo of Death"), but it's still a weird nickname. I'm sure Harry loves being called something that reminds him of his parents' grisly murder ten times a day. Like Luke Skywalker, baby Harry was hidden in exactly the first place his enemies might go looking for him: with his only relatives. I understand there were enchantments placed on the joint that kept him safe from magical attack, but couldn't the death eaters have just hired a Muggle thug to shoot him in the face? They're too good for that? Not only is the Dursley house an obvious hiding spot, it's a terrible place to live. Here's this kid that's survived his parent's brutal death and is seen as an icon of hope an sacrifice by his people and they dump him with the people who will treat him only slightly better than his worst enemies would. These are parents that got kicked out of a Roald Dahl book for being too nasty. His bedroom is a tiny cupboard under the stairs and his possessions are few. 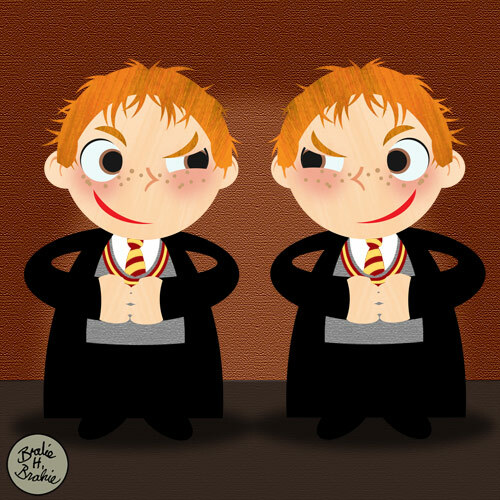 I guess that's why when he eventually learns that he's loaded with gold in a goblin bank, he never chooses to share any of his mountains of wealth with the poor Weasley family that spends the majority of their time trying to protect his rich behind. 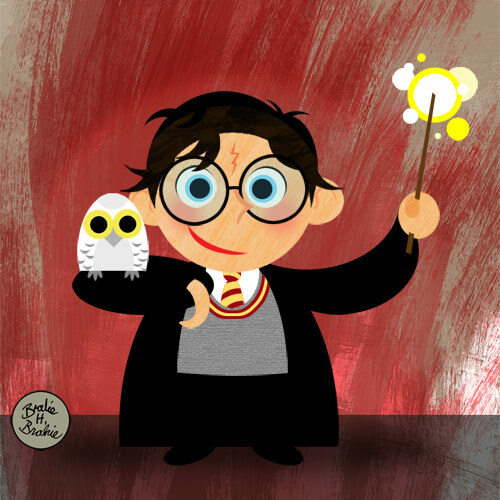 Also depicted here is Harry's pet snow owl Hedwig. People in the wizarding world use owls to deliver their mail. Oddly, they live among us in secret, but have never caught on to a faster method of delivering information to people far away than strapping a piece of paper to a bird. They can fly and teleport and make items appear out of nowhere, but have nothing approaching e-mail and cell phones. You can't use a wand and a cell phone? Do your magical vibrations interfere with the signal? Not only do cell phones receive calls and messages instantly, you don't have to clean up their poop either. Look into it, wizards.